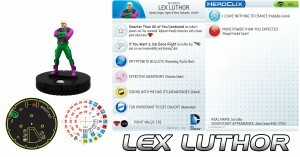 WizKids is showing off another preview mini for their Superman set that's upcoming for HeroClix with a look at Lex Luthor. In the upcoming DC HeroClix: Superman and the Legion of Super Heroes set, where would our hero be if it was not for his greatest villain. Lex Luthor is a supervillain, and a founding member to the Legion of Doom, who believes that ordinary laws of right and wrong do not apply to him.